The Tadoba Andhari Tiger Reserve encloses interesting wildlife sightings, bursting with tigers and a huge variety of other wild animals, birds, and reptiles, including leopard, sloth bear, hyena, jackal, wild dog, sambar, and many more. Tiger is the main attraction of this park and the tourists can see them occasionally in the deep forest or near the lake. 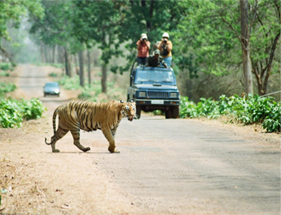 It is one of the most popular tiger reserves in India, known for best tiger sightings. There are a lot of other wild animals in Tadoba Tiger Reserve, here are some details that can give you an insight of wildlife in Tadoba tiger reserve. 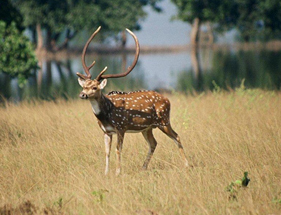 Besides Royal Bengal Tigers, Tadoba has an abundance of other creatures, which include, leopard, cheetal, chinkara, langoors, nilgai, barking dear, blue bull, spotted dear, flying squirrel, sloth bears, gaur, dhole, striped hyena, small Indian civet, jungle cats, sambar, and chausingha. It sustains the Marsh Crocodile and the endangered reptiles, including Indian Python, common Indian monitor, Terrapins, Indian Star Tortoise, Indian Cobra, and Russel's viper. It houses 195 species of birds, including a wide variety of water birds, raptors, and endangered species and 74 species of butterflies, including the pansies, monarch, Mormons, and swordtails. It gives life to many insect species, including the endangered danaid egg-fly and great eggfly and dragonflies, jewel beetles, signature spider, giant wood spider, wolf spiders, crab spiders, and lynx spiders. There are certain night animals too which make their presence felt specially during night like, the ratel, Indian Pangolins, porcupines, four horned antelopes, and gaurs.